I had some issues getting all of the separate sections of my outline indented properly using the Wiki codes, so I just copied the screen of my word processor. I hope you all can view this! Please let me know if there are any issues accessing this image. I like the level of detail included in your index. This should make it easy for users to navigate through your website. Will this be in a top bar, side bar or both? Will all options be displayed or will there be drop down menus from the major (a,b,c,d,e) index points? This sitemap is really well-organized and it looks like the exhibit will be very easy to navigate. My only question would be about the distinction of calling it a digital archive/exhibit. Will users be able to search through the various images and documents individually, or will their searches direct them to the "Day ___" page where the image/document can be found? Basically, will users be able to take those "Days" apart and use the resources within for their own research? The site map looks very well organized and I like how you have structured your search options. 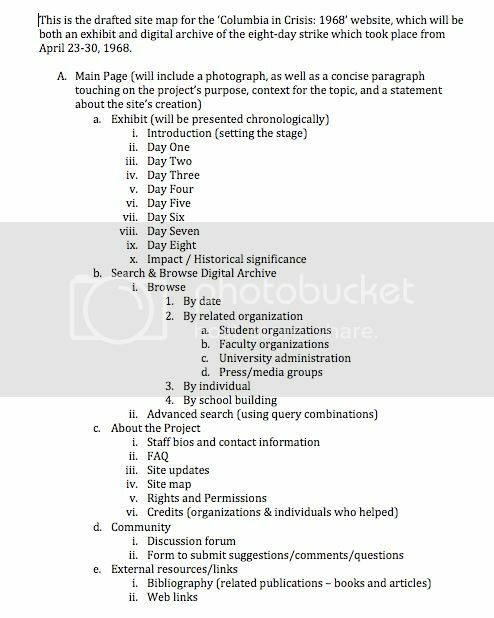 To that end, will there be any pages that just have a list of all the organizations/people or will you have to search for them to get to their pages? Is that how the Search/Browse section will be designed—as a listing of the items to browse? I'm sure you will clarify that more in your added value essay. Great start.